Devil May Cry 5 has already sold more than two million copies worldwide. The game’s director Hideaki Itsuno shared the news during a panel at GDC this week (via VG247), thanking fans worldwide for their support. It’s worth noting that DMC4 sold only three million copies in its entire lifetime. With just two weeks having passed since release, it’s already looking as though DMC5 is set to smash some of the series’ records. The news doesn’t necessarily come as a huge surprise, however. 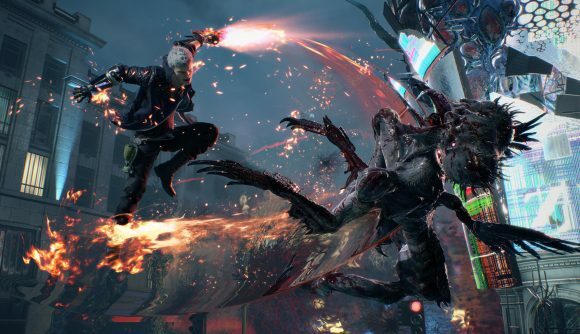 When it was first released, Devil May Cry 5 had more concurrent players on Steam than the hugely anticipated Resident Evil 2 remake, and has since received largely positive reviews across the board. Fans had to wait over 11 years to receive the next iteration in the mainline series, but luckily for Capcom, fans seem to feel that the wait was worth it. Devil May Cry 5 follows Dante, Nero, and new protagonist V as they hack-and-slash their way to stop the demon Urizen. The game features the same glorious mix of style and gore that we fans have grown to love, and includes a wicked soundtrack to boot. Admittedly, hack and slash JRPGs aren’t for everyone. If you like to get your dark fantasy hit in other ways, you might be pleased to learn that Vampire: The Masquerade – Bloodlines 2 has finally been announced, and will be coming to PC in the first quarter of next year.